Lately I have been listenning to so much western swing / hillbilly I always have some tune playing in my head. And of course, very close in my mind are all the stage clothes. Although they were sometimes way too sparkly or « fringy » for me, and were perfect on stage, I love western 40s 50s charming outfits. So here is my last project, celebrating the not-very-hot-weather here in France : my first of many honky tonk shirt. A simple, first project, on which I could practice some of the tehnics I learned, such as embroidery, or « pistol cuffs ». 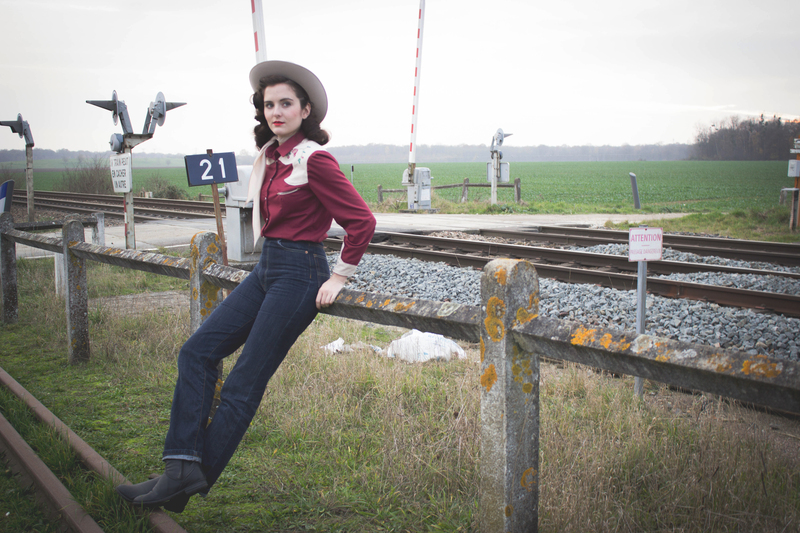 I wanted to get a result close to these loooovely 1940s honkytonk outfits, simple, easy to wear everyday. They are often so expensive, and so rarely my size that I came to the idea of making my own too. A bit closer : aligned pearl snap fasteners, yiiis! Aaaand the big new try : hand embroidery. It is not perfect, but let’s say I am satisfied with this first try, and I can’t wait to make others! I have so many ideas ! Did you / are you also sewing honky tonk / western clothes ? I’m dying to see it, leave the link in the comments ! You did a wonderful job. You look like pictures of my mother when she was young. She is an authentic cowgirl of the era.